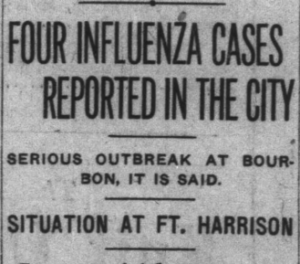 Spanish Influenza hit Indiana in September of 1918. 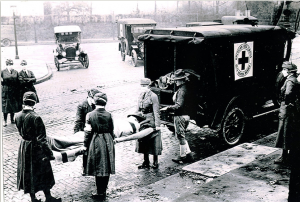 While the virus killed otherwise healthy soldiers and civilians affected by WWI in other parts of the world since the spring, most Hoosiers assumed they were safe that fall. Still, newspaper headlines made people nervous and health officials suspected that the mysterious flu was on their doorstep. In April of 1917, the United States joined the Allied effort. Residents of Indianapolis, like most Hoosiers, largely united around the war effort and organized in its support. 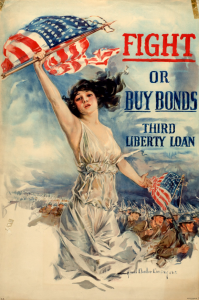 In addition to registering for military service, the National Guard, and the Red Cross, they organized Liberty Loan drives to raise funds and knitting circles to make clothing for their soldiers. Farmers, grain dealers, and bankers met to assure adequate production and conservation of food. They improved the roads in order to mobilize goods for the war effort, including a road from Indianapolis to nearby Fort Benjamin Harrison located just nine miles northeast of downtown Indianapolis. This penchant for organization would be extremely valuable throughout the bleak coming months. Indianapolis News, August 17, 1916, 1, accessed Hoosier State Chronicles. The U.S. Army constructed Fort Benjamin Harrison over a decade earlier with the intention of stationing one infantry regiment there. However, with America’s entry into the war, Fort Ben (as it was colloquially known) became an important training site for soldiers and officers. It also served as a mobilization center for both Army and National Guard units. In August 1918, just prior to the flu outbreak, the War Department announced that the majority of the fort would be converted into General Hospital 25. The Army planned for the hospital to receive soldiers native to Indiana, Kentucky, and Illinois who would be returning from the front as wounded, disabled, or suffering from “shell shock.” By September, the newly established hospital was ready to receive a few hundred “wounded soldiers returning from France.” But the soldiers stationed there began to fall ill.
Indianapolis News, September 26, 1918, 1, accessed Hoosier State Chronicles. Indianapolis News, September 26, 1918, 22, accessed Hoosier State Chronicles. 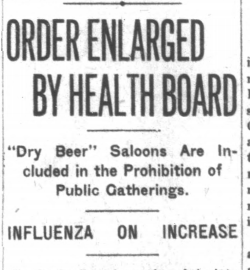 While the front page reassured the city’s residents that there was nothing to fear and that the military had everything under control, a small article tucked away on page twenty-two hinted at the magnitude of the coming pandemic. The body of twenty-seven-year-old Walter Hensley arrived in the city from a naval training detachment on the Great Lakes. He had died of Spanish Influenza. Only a few weeks later, Indianapolis would be infected with over 6,000 cases with Fort Benjamin Harrison caring for over 3,000 patients in a 300 bed facility before the end of the epidemic. The Motor Corps of St. Louis chapter of the American Red Cross, 1918, Influenza Encyclopedia, University of Michigan Center for the History of Medicine, accessed influenzaarchive.org. Indianapolis was not alone in its unpreparedness, as little was known about the strange flu. Influenza was certainly not uncommon, but most flu viruses killed the very young, sick, and elderly. The 1918 influenza, on the other hand, killed otherwise healthy young adults ages twenty to forty – precisely the ages of those crowded into military camps around the world. Furthermore, the disease could spread before symptoms appeared. Infected soldiers and other military personnel with no symptoms amassed in barracks and tents, on trains and ships, and in hospitals and trenches. As troops moved across the globe, so did the flu. It took on the name “Spanish influenza,” because unlike France and England, Spain did not censor reports of the outbreak. 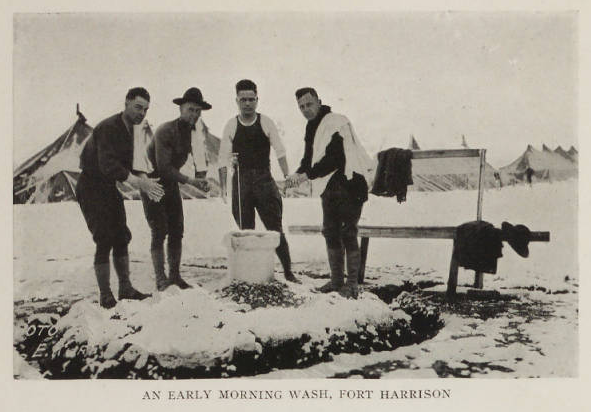 “An Early Morning Wash, Fort Harrison,” in Benjamin D. Hitz, ed., A History of Base Hospital 32 (Indianapolis: Indiana Red Cross, 1922), accessed IUPUI Center for Digital Scholarship. 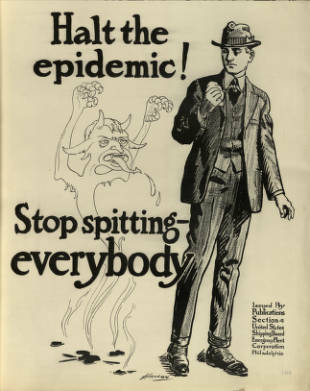 Hanlon [artist], Halt The Epidemic, 1918, poster, United States Shipping Board Emergency Fleet Corporation, George F. Tyler Poster Collection, Temple University Libraries. Over the next few days, newspapers reported that the nation’s training camps were infected. 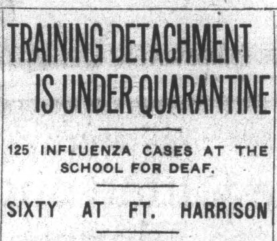 On September 17, the Richmond Palladium and the Indianapolis News reported “approximately four thousand men are in quarantine today as the result of Spanish influenza breaking out in the aviation camp of the naval training station” on the Great Lakes in Illinois. The following day, the South Bend News-Times reported that “Spanish influenza now has become epidemic in three army camps” with 1,500 cases in Massachusetts, 1,000 in Virginia, and 350 in New York. The military scrambled to meet the needs of the infected and anxious citizens awaited a response from the government’s health services. 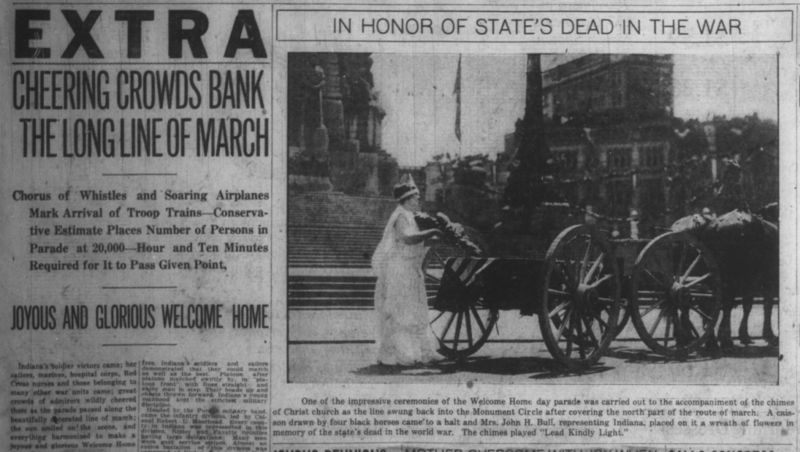 Indianapolis News, September 19, 1918, 1, accessed Hoosier State Chronicles. Avoid crowds . . . until the danger of this thing is past. The germs lurk in crowded street cars, motion picture houses and everywhere there is a crowd. They float on dust, and therefore avoid dust. The best thing to do is to keep your body in a splendid condition and let it do its own fighting after you exercise the proper caution of exposure. Dr. John Hurty, photograph, n.d., Purdue University Archive, accessed Historic Indianapolis. If all spitting would immediately cease, and if all coughers and sneezers would hold a cloth or paper handkerchief over their noses and mouths when coughing or sneezing, then influenza and coughs and colds would almost disappear. We also must not forget to tone up our physical health, for even a few and weak microbes may find lodgment in low toned bodies. To gain high physical tone, get plenty of sleep in a well ventilated bedroom. Don’t worry, don’t feast, don’t hurry, don’t fret. Look carefully after elimination. Eat only plain foods. Avoid riotous eating of flesh. Go slow on coffee and tea. Avoid alcohol in every form. Cut out all drugs and dopes . . . Frown on public spitters and those who cough and sneeze in public without taking all precautions. Indianapolis News, September 27, 1918, 1, accessed Hoosier State Chronicles. Most notably, in this same September 26 front page article in the Indianapolis News, Hurty stated that Indiana had “only mild cases . . . and not deaths.” This would soon change. 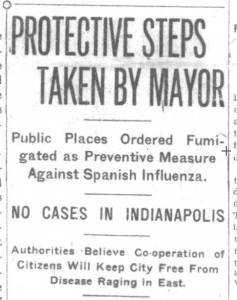 To prevent a Spanish Influenza epidemic in Indianapolis, Mayor Charles W. Jewett today directed Dr. Herman G. Morgan, secretary of the city board of health, to order all public places – hotel lobbies, theaters, railway stations and street cars – placed at once in thorough sanitary condition by fumigation and cleansing. Indianapolis News, September 30, 1918, 1, accessed Hoosier State Chronicles. By the end of the month, influenza had reached the civilian population. Officials continued to discourage people from gathering in crowds and encouraged anyone with a cough or cold to stay home. The News reported that Indianapolis movie houses had begun showing films on screens in front of the buildings instead of inside the theaters. “Bird’s-Eye View of a Portion of the Army Post,” in Stephen Bower, A History of Fort Benjamin Harrison, 1903-1982 (Fort Benjamin Harrison, Indiana: Command History Office, 1984), accessed archive.org. Meanwhile, the numbers of infected men at Fort Benjamin Harrison rose. By the end of September, officers in charge of the base hospital reported that there were “about 500 cases of respiratory disease” at the camp. Although newspapers still reported that it was unclear whether these illness were indeed Spanish influenza, it was clear that the situation was growing dire. 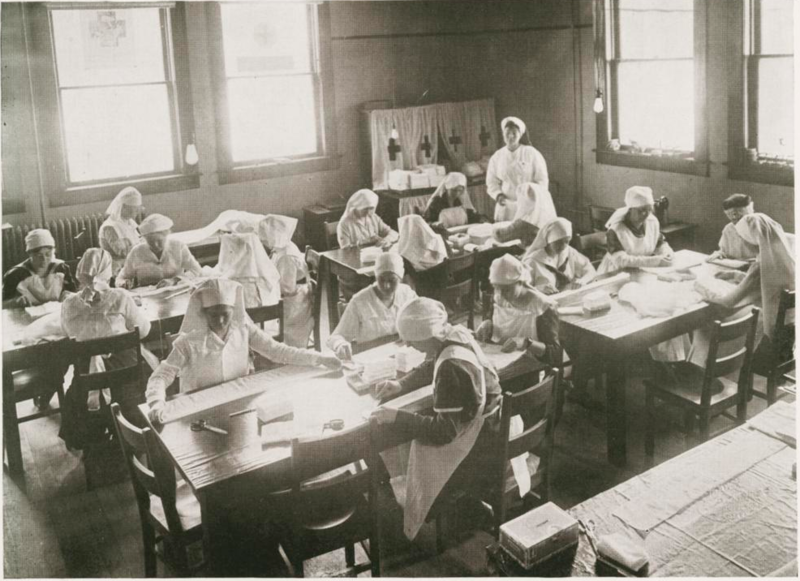 Because so many nurses believed Indiana was safe from the pandemic and volunteered to work out east to fight the virus, the fort’s hospital only had twenty trained nurses to care for the hundreds of sick men. 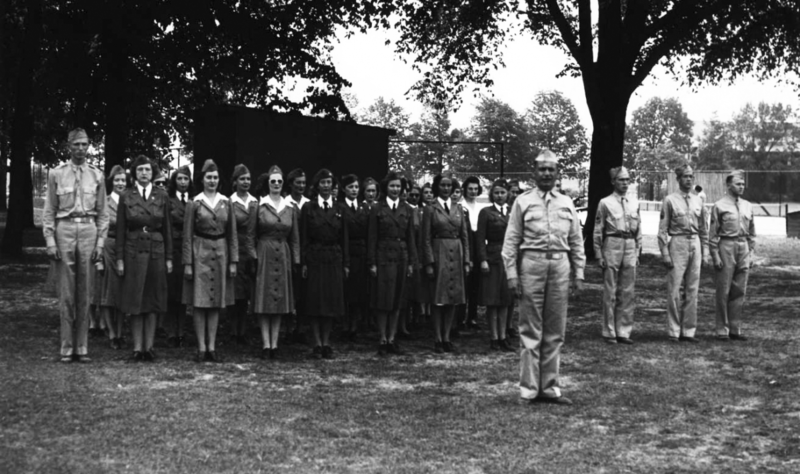 The Indianapolis News reported that enlisted soldiers were “being employed as nurses” and that one battalion of engineers had been completely quarantined. Meanwhile, notices of soldiers dying from influenza and related pneumonia began to fill the papers of Indianapolis newspapers. 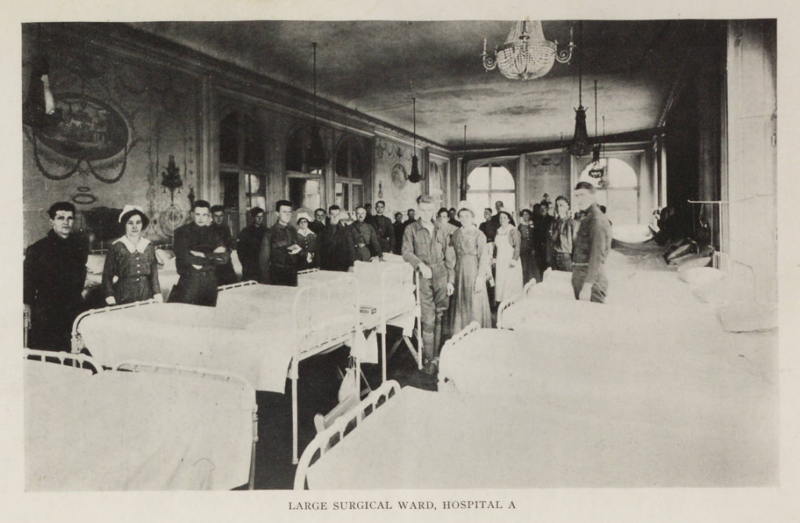 Base Hospital 32 [which had trained and mobilized at Fort Benjamin Harrison was sent to France before the outbreak] in Benjamin D. Hitz, ed., A History of Base Hospital 32 (Indianapolis: Indiana Red Cross, 1922), accessed IUPUI Center for Digital Scholarship. By October 1, the number of sick men at Fort Benjamin Harrison rose to 650 cases. The Indianapolis News reported, “No new troops are arriving at the engineer camp,” and “fifty engineers were lent to the base camp hospital yesterday to act as orderlies and clerks and to release medical corps for service as nurses.” The article concluded, “The hospital needs a number of trained nurses.” While the bodies of Hoosier soldiers stationed at camps around the country arrived in the city, Fort Benjamin Harrison had yet to lose one of its own. Less than a week later, that changed. On Sunday night, October 6, 1918, ten soldiers died in the fort’s hospital bringing the total for the week to forty-one deceased soldiers. Four civilians died from influenza and six more from the ensuing pneumonia. At the fort, officials reported 172 new cases of influenza (bringing the total to 1,653 sick soldiers). Of these, the base hospital was attempting to care for 1,300 men. Indianapolis News, October 7, 1918, 1, accessed Hoosier State Chronicles. 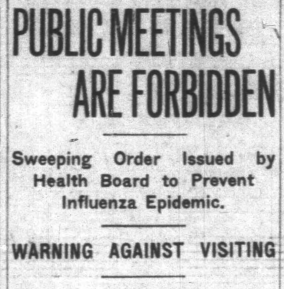 In response, Dr. Morgan announced “a sweeping order prohibiting gatherings of five or more persons.” The front page of the News read, “PUBLIC MEETINGS ARE FORBIDDEN,” and noted that all churches, schools, and theaters were closed until further notice. Only gatherings related to the war effort were exempt, such as work at manufacturing plants and Liberty loan committee meetings. The prominent doctor even discouraged people from gathering at the growing numbers of funerals, encouraging only close family to attend. In October of 1918, Indianapolis must have looked like a ghost town. Indianapolis News, October 7, 1918, 1, Hoosier State Chronicles. 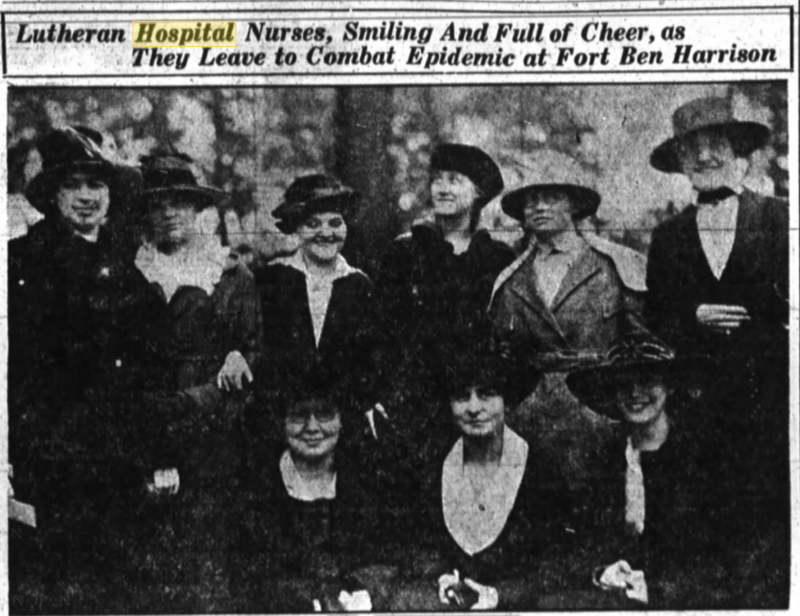 The sick desperately needed nurses and nowhere more than at Fort Benjamin Harrison. Two front page Indianapolis News headlines for October 7 read, “Ft. Harrison Soldiers in Dire Need of Nurses,” and “Graduate Nurses Are Needed for Soldiers.” The News reported that at Fort Ben “soldier boys are dying for lack of trained help” and that the “few nurses in service are worn to the point of exhaustion.” Officers of the local Red Cross worked to redirect nurses who were awaiting transport overseas to the local effort against influenza, while the women of the motor corps of the Indianapolis Red Cross were busy transporting needed supplies by automobiles. Motor Corps Member in Formation at Fort Benjamin Harrison, photograph, 1918, Indiana Red Cross, accessed IUPUI Center for Digital Scholarship. Willing to risk their lives in the nation’s service in helping combat the ravages of Spanish influenza, ten Lutheran hospital nurses left the city . . . for Fort Benjamin Harrison, near Indianapolis, Ind., where they will enter service in the military base hospital, which is very urgently in need of qualified nurses to aid in fighting the epidemic. Fort Wayne Sentinel, October 8, 1918, 1, accessed Newspapers.com. The same day, a medical officer from the fort hospital told the Indianapolis Star that several trained nurses had reported for duty “within the last few hours to relieve the situation” and that “everything that can be done for the boys is being done.” The Star reported that the officer was responding to “wild rumors” that the soldiers were not getting adequate care. However, the Indiana Red Cross and Board of Health knew that more nurses were needed. On October 11, the Fort Wayne Sentinel shared Dr. Hurty’s report that “during last night thirty soldiers had succumbed to the ravages of the epidemic at Fort Harrison, some of them expiring before their uniforms could be removed from them.” One of the men was Captain C. C. Turner of the medical reserve who had been sent to the fort from another camp only a few days before to help combat the influenza outbreak. His records had not even arrived yet and his relatives could not be contacted. 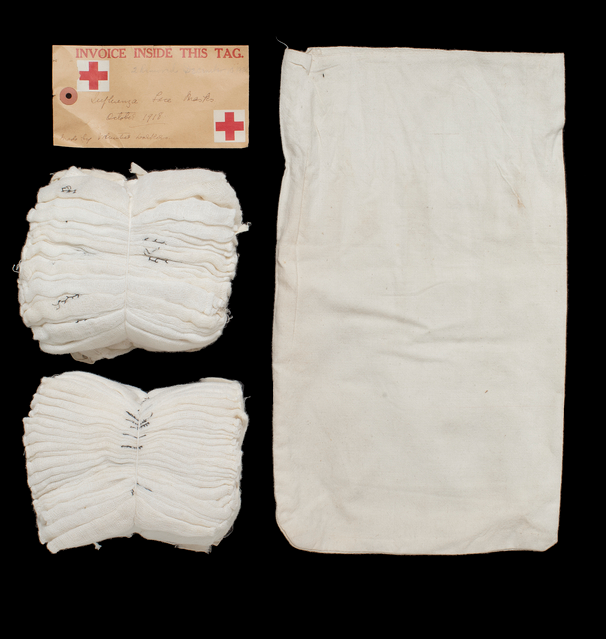 American Red Cross Influenza Mask Bundles and Bag, 1918-1919, ID#6119.9.1-4, Minnesota Historical Society Collections. 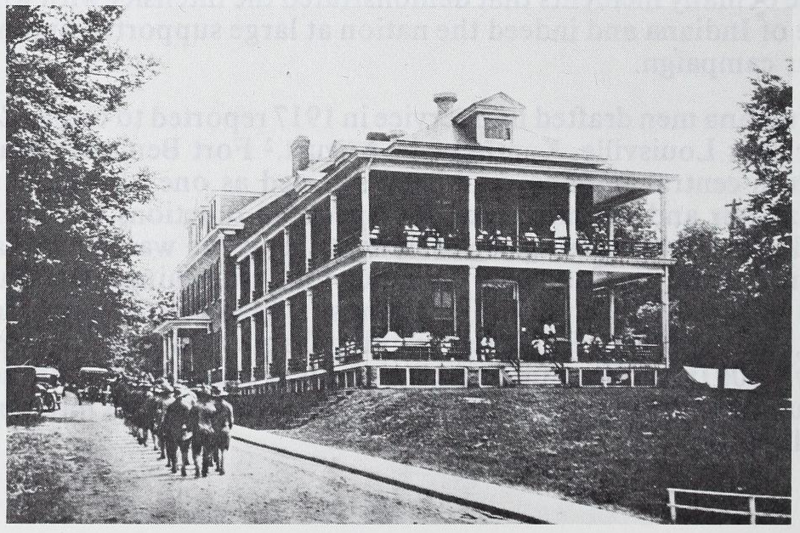 The medical staff of Camp Benjamin Harrison has succeeded in fourteen days in expanding a hospital of about 250 beds to one of 1,700 beds by occupying the well-built brick structures formerly used as barracks. These they were able to equip adequately with the assistance of the American Red Cross which . . . proved itself able to supply every demand made by the army on the same day the request was made. The doctors reported that the hospital had treated 2,500 patients in the previous two weeks. Despite their heroic efforts, the epidemic persisted. Indianapolis News, October 11, 1918, 1, Hoosier State Chronicles. The city also bolstered its efforts as the number of infected rose to 1,536 civilians. 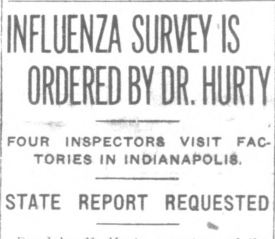 On October 11, the Indianapolis News reported 441 new cases of influenza in a twenty-four hour period. In response, Dr. Morgan announced that the city board of health “enlarged the order against public gatherings of every description” and that the Indianapolis police department would enforce the order. “Dry beer saloons,” which were prohibition era gathering places, were closed. Department stores were prohibited from having sales and would be closed completely if found too crowded. Finally, the board of health directed its officers to post cards reading “Quarantine, Influenza,” on houses containing a sick person. 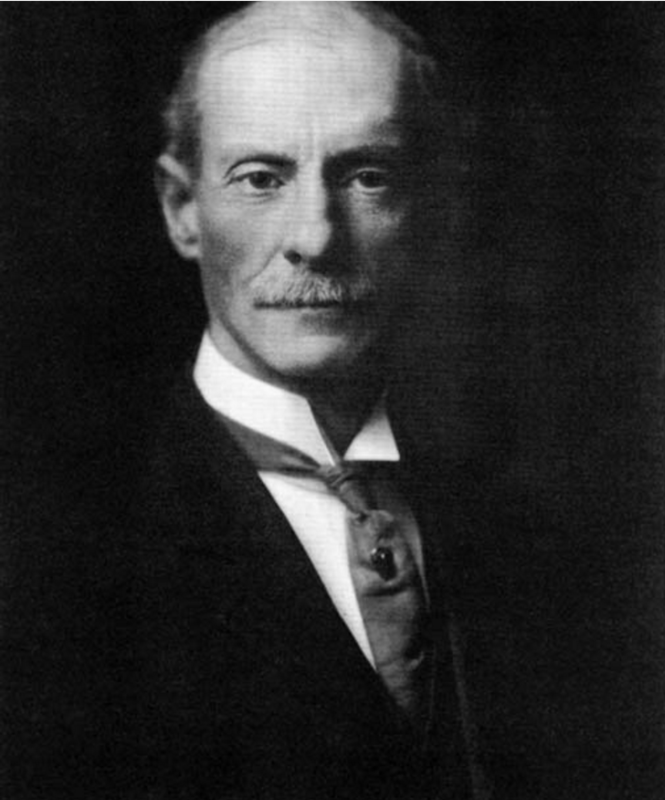 The next twenty-four hours brought the city 250 new cases and the fort 47 new cases of Spanish flu. In that same period, twenty four young men died at Fort Benjamin Harrison. The epidemic was peaking. 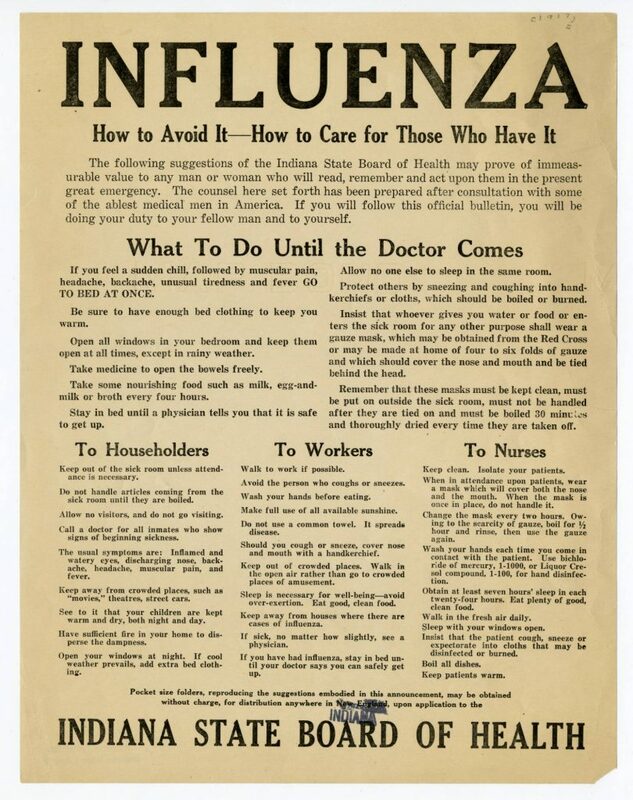 Indiana State Board of Health, Influenza: How to Avoid It, circa 1918, broadside, Indiana State Library Broadsides Collection, accessed Indiana State Library Digital Collections. A week later there was some evidence that the virus began to relax its grip on the fort, if not the city. The Indianapolis News reported that while the previous twenty-four hours had brought twenty-eight deaths to the city, the fort suffered only four. And while the city reported 252 new civilian cases, the fort reported only twelve new cases. Since the fort was struck by influenza before the city, civilians must have seen this decrease at the fort as a good sign. The plague had almost run its course. On October 30, Dr. Hurty announced that the closing ban would be lifted in Indianapolis. Newspapers reported the lowest number of new cases since the start of the deadly month and Fort Harrison reported that not one person had died in the previous twenty-four hours. Schools could reopen Monday, November 4 and people with no cold symptoms could ride street cars and attend movie theaters. Through the end of 1918 and the beginning of 1919, there were small resurgences of the epidemic. Morgan ordered the wearing of gauze masks in public and discouraged gatherings. However, the worst had passed, and the war had ended. Indianapolis Star, November 24, 1918, 6, Indiana State Library, microfilm. As Indianapolis began to return to normal, the damage was assessed. On November 24, 1918, the Indianapolis Star tallied the state’s loss at 3,266 Hoosiers, mostly young men and women. This massive loss of citizens in their prime also left 3,020 children orphaned. 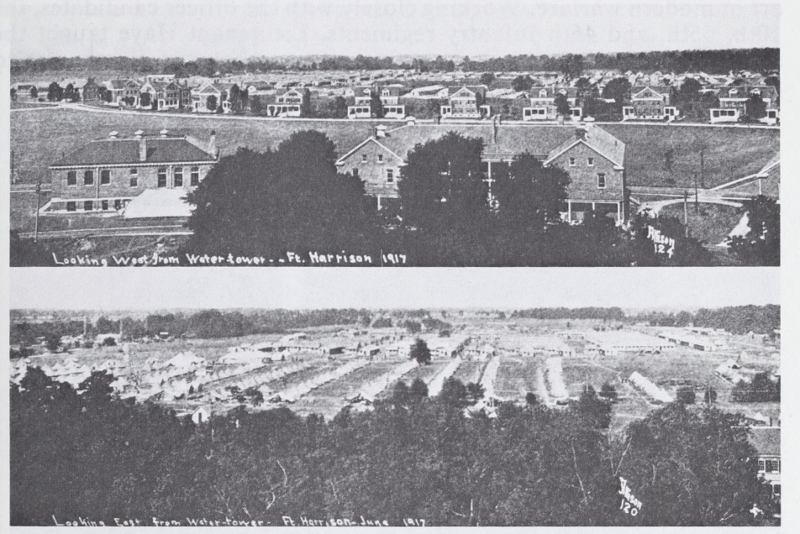 The War Department also assessed the losses at Fort Benjamin Harrison. The Surgeon General reported that General Hospital 25 at the fort treated a total of 3,116 cases of influenza and 521 cases of related pneumonia. The hard work of the medical staff and brave volunteers transformed a fort designed to care for a few hundred injured men into a giant hospital caring for thousands. Panoramic View of Indianapolis, 1918, Influenza Encyclopedia, University of Michigan Center for the History of Medicine. The city also benefited from leadership of the committed men of Indianapolis and the State Board of Health, as well as cooperative citizens. According to the University of Michigan Center for the History of Medicine, “In the end, Indianapolis had an epidemic death rate of 290 per 100,000 people, one of the lowest in the nation.” The center attributes the city’s relative success to “how well Indianapolis as well as state officials worked together to implement community mitigation measures against influenza,” whereas in other cities “squabbling among officials and occasionally business interests hampered effective decision-making.” Indianapolis leaders presented a united front, shop and theater owners complied despite personal loss, and brave men and women volunteered their services at risk to their own lives. Somehow only one of the heroic volunteer nurses stationed at Fort Benjamin Harrison lost her life. Indianapolis News, May 7, 1919, 1, Hoosier State Chronicles. Hospital 32 Nurses in Welcome Home Day Parade, photograph, 1919, Indiana State Library Digital Collections. On May 6, 1919, the Indianapolis News replaced columns of text detailing the influenza-related losses with jubilant articles about the city’s preparations for Welcome Home Day. Trains unloaded Hoosier soldiers still carrying their regimental colors. Indianapolis decked herself out in red, white, and blue. 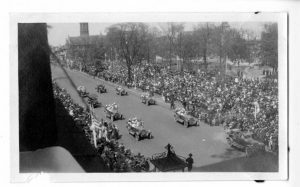 On May 7, 1919, 20,000 men and women walked in the welcome parade that stretched for 33 blocks. Many, like the men and women of Hospital No. 32, trained and mobilized at Fort Benjamin Harrison. Many had survived the Spanish Influenza, nursed the sick, or lost a friend to the pandemic. Not a single article mentioned it. The city was ready to move towards peace and healing. “Guns, Germs, and Indiana Athletics, 1917-1920: How Did the Great War and the Great Pandemic Affect Indiana Sports,” Blogging Hoosier History.